Perfect gift for my girlfriend. I love the pendant! The gold and blue really is beautiful. Beautiful and great workmanship. Customer Service is great! I wear this everyday and love it's energy. Have not received this order???? I have placed this order in early January and still have not received. Please contact me at your earliest convenience. This seems to be taking too long???? Amazing ** feel like Magic ! I wear this item all the time. And I'm the sort of person who has never worn any form of jewelry. So this one is special. I am sure it is programmed as advertised. I actually feel good when wearing it, it does feel "high vibe." Having said that, I ordered the lapiz pendant with green stone. When it came at first glance I thought it was a dull sodalite. It is Lapiz but it looks like it was soaked in water and faded and the gold in it is minimized/polished off so that it looks a dull grey. The green stone is actually a purple topaz with green flashes if the light hits it right. It is meant to be worn against the skin, so i guess looks don't matter but it looks nothing like what was advertised and nothing I would wear for the looks of it. My son is energy sensitive and feels it was programmed wonderfully and may order one for him eventually. These were bigger than I expected. A nice, perfect size. I would recommend this gemstone to any one. Definitely top mark from me! Beautiful. My second necklace. I love it. I've had a knee injury since 4/29/2017. And I can say honestly say I used a walking stick lately my knee have been getting better everyday. 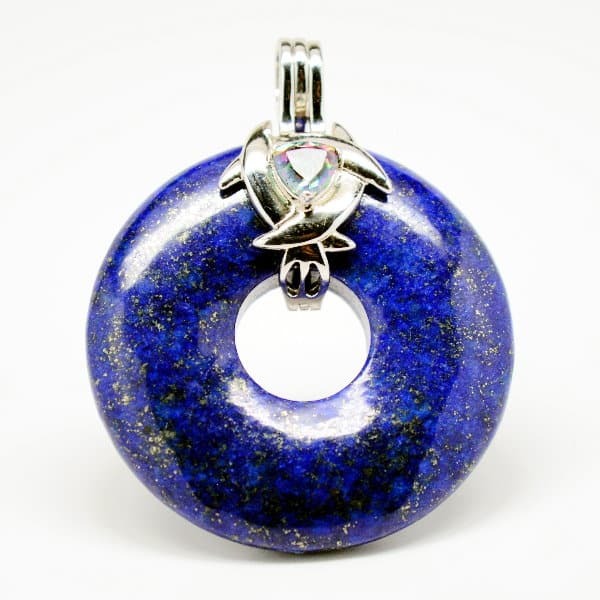 I did try to connect with the LAPIS LAZULI STONE but it's like sometimes I fell it then other days nothing. am I doing it right. Please help me. This Pendant is excellent! The moment you´ve got it you feel its power! My meditation has improved a lot using this magnificent stone pendant. Thank you very much!